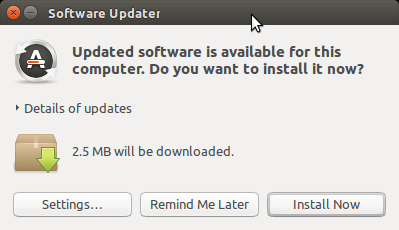 Unlike some operating systems (*cough* “Windows” *cough*), Ubuntu is pretty good about letting you know that updates are available, and how large they are. If updates are available, a convenient window pops up just after you log in that provides this information to you. However, there are times when you don’t want to update just then and there. You may be in a hurry and just need to print out a single file or send a single email. If it’s not convenient, you can tell Ubuntu to remind you later. 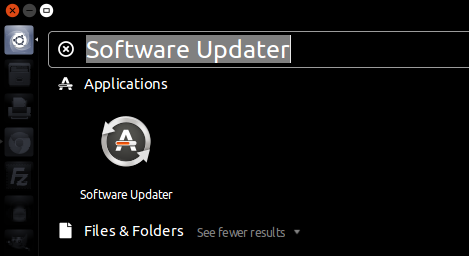 If you want to manually check for updates, or download an update you know is available after you’ve already told Ubuntu to remind you later, the procedure is fairly simple. If you have questions, please add a comment below.